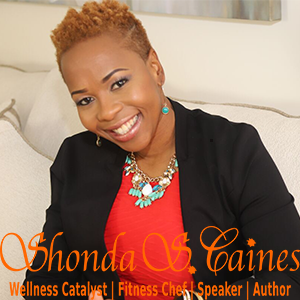 Shonda Caines is a Wellness Catalyst, Vegan Fitness Chef, Speaker and Best-Selling Author. After losing and keeping off 90 lbs, she strives to empower women to maximize their health and fitness. Through specialized programs and a holistic approach, she offers tools, tips and strategies to help clients Awaken Their Wellness. Shonda holds a Master of Public Administration and is a Certified Personal Trainer with certifications in Fitness Nutrition, Weight Loss and Group Exercise Instruction. A self-taught runner and cyclist, she went from nearly drowning in 2006 to learning how to swim and competing in a triathlon in 2012. Shonda is a frequent competitor in races from triathlons to marathons and is an RRCA Run Coach. All of Shonda’s race medals are reminders of how far she’s come. Her most memorable race was the Old Glory 50 mile ultra marathon which taught her that when it comes to physical endurance, it’s mind over matter. She says “I went from daydreaming about losing weight on the couch to signing up for races and marathons. I can help you achieve your goals, too.” Let’s Awaken Your Wellness, Together!